If you are anything like me, you may struggle to keep up with a years worth of Hollywood releases. One easy way to sort through the noise is to focus on what the awards and festivals determine are worthwhile investments for your time, and you can further narrow the movies down by looking at the trailers for them. But Apple and iTunes makes it easier. 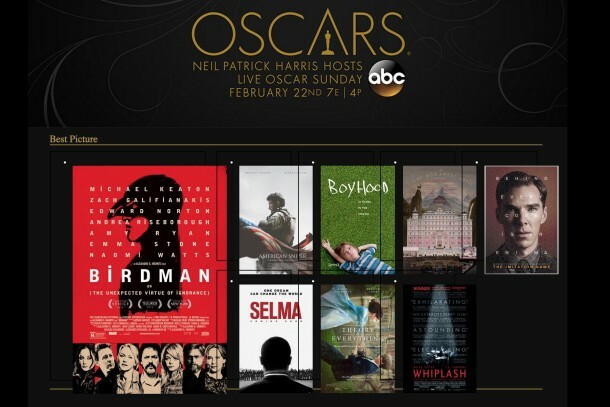 Indeed, Apple has an excellent ongoing continually updated Oscars page, go here to check out this page at apple.com. It gives a nice run down of the nominations with direct links to media for each category. The trailers are in HD and make a nice primer for the most recent Academy Awards ceremony. Now I feel so in tune with pop culture! You’re sure to find something you’ll enjoy, so enjoy the trailers, then head over to iTunes to rent a movie, or Redbox works too. It gives a nice run down of the nominations with direct links to media for each category. The trailers are in HD and make a nice primer for tonight’s Academy Awards ceremony. It gives a nice run down of the nominations with direct links to media for each category. The trailers are in HD and make a nice primer for tonight’s Academy Awards ceremony. Now I feel so in tune with pop culture! The trailers are in HD and make a nice primer for tonight’s Academy Awards ceremony. Now I feel so in tune with pop culture! Hey, thanks so much for the tips.